A little fun 'golf' style. The Golf Boys featuring Bubba Watson, Ben Crane, Rickie Fowler, & Hunter Mahan. Good guys!! Rickie and Hunter went to Okie State and both Hunter and Ben are from Dallas, so I feel a kindred spirit. Bubba was inspiring at the Masters -- I noticed Rickie Fowler hugging him @ the 18th green. (This was before I was aware of the video). Oklahoma State and Georgia have battled for the NCAA Golf Championship for some time --- I guess Mahan and Fowler and Bubba are very friendly rivals!! Thankyou NR, skies are really getting ugly here in N. Texas. I haven't seen the news yet this evening whether we are going to have any of it flow into Texas tonite or not. GE & I just got home from an afternoon with JSM & CC, she was skating in competition and she was absolutely gorgeous, she is doing so well with her skating everyone is so proud of her! We will keep everyone posted if the weather gets rough here, would love the rain but never want to encounter a twister thats for sure. I know I posted a picture of when my dog had her surgery and I wanted to post a picture for everyone to remember her by. Today our dog Angelina passed away. Special thanks to Klaas for making this picture for me. I am so sorry San. Prayers for you all. It is so hard when we lose our beloved fur babies. Lovely picture Klaas. I'm sorry San. 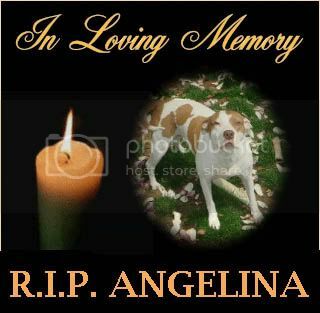 RIP Angelina Sweet face in her photo. Sounds like such a wonderful dog, San. I am sure you are going to miss her. Thanks Muffy and Bearly. She lived a good life and that's all I could have asked for. I knew she only had a little time left so I was prepared for the worst. Klaas did a great job on the tribute picture for her! San, I am so sorry for your loss. I had a pit bull once and he was the same way -- so friendly. Oh, San. I'm so very sorry. Please know you have a whole bunch of arms that are reaching out to you and wishing we could just change it so that Angelina would still be with you and be full of health. You're in my thoughts and prayers, and I too want to comment on what a lovely tribute picture Klaas made for your beloved furbaby. Hugs from me to you, San. Thank you TM, Sister and CBB for your kind words. It's so nice to hear you say that everyone loved your Angelina. She gave and she got and I'm glad she had such a good and full life. I join with the others with my condolences for the loss of your precious Angelina. Some people don't understand how animal lovers can get so attached to their animals. I say that an animal lover is a people lover and would never do the horrific things to either animals or people. Dogs are my favorite -- they wiggle right into my heart and take me over. I have 9 dogs -- two rescues from a kill shelter, two senior blue heelers who were given up by their owners: one is blind, the other just has bad arthritis in her hips. The others, except our male Chihuahua who was born on my husband's lap on 9/9/99, are dogs that my kids have brought home to me because they knew I couldn't say no. Our tiny female Chi, the mother the our make, just died last summer and we were in mourning for a long time. I was out of town and my husband didn't even tell me until I got home because he didn't want to upset me. Sorry to be so long -- just wanted you to know that others are feeling the same heartbreak of the loss of a furry baby as you are. 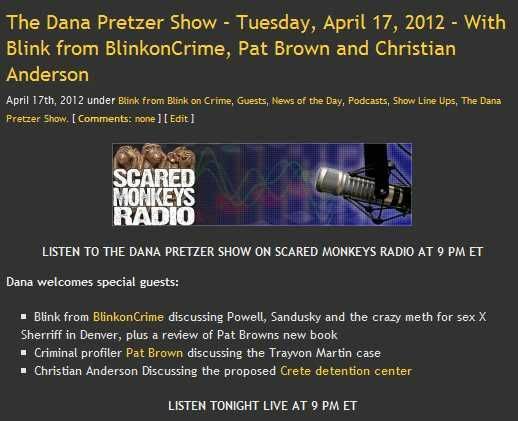 Love her, hate her, Nancy Grace can make fun of herself. I was discharged yesterday after another hospital stay for respiratory issues. also meds, and breathing treatments every 4 hours. Feb. was respiratory failure. The present is bialateral pneumonia. I will be 60 in June, have had smoked 1 pack a day for 40 years. We see the ads against the health effects of smoking, we read about them. I am a poster child at my age for the years of prior abuse. My message to u is this, STOP ! STOP before u experience adverse effects from the nicotine. Previously being highly addicted to smoking, I know it is possible to drop the habit. Please lift me up in your prayers for a fast recovery and restored health. I have too many things I want to do yet ! Page created in 6.138 seconds with 20 queries.